The Indian Air Force on Thursday displayed parts of an AMRAAM beyond visual range air-to-air missile as evidence to "conclusively" prove that Pakistan deployed US-manufactured F-16 fighter jets during an aerial raid targeting Indian military installations in Kashmir. Pakistan had on Wednesday categorically said that no F-16 fighter jets were used and denied that one of its planes had been downed by the IAF. "There is enough evidence to show that F-16s were used in this mission and Pakistan is trying to hide this fact. 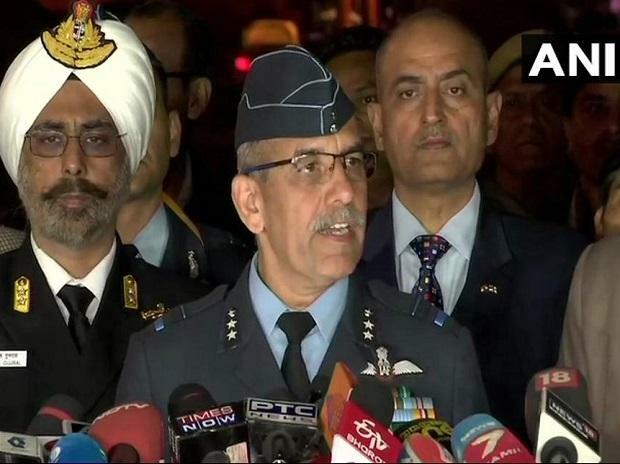 Also, parts of AMRAAM air-to-air missile which is carried only on the F-16s in Pakistan Air Force were recovered East of Rajouri within the Indian territory," Air Vice Marshal R G K Kapoor, assistant chief of Air Staff, told a news conference. The IAF also showed pieces of the the AMRAAM missile, fired by Pakistani F-16, at the first joint news by the three services after Pakistani fighter jets targeted Indian military installations in an air raid on Wednesday. "The fact remains that one F-16 of PAF was shot down by an IAF MiG-21 Bison aircraft," said the Air Vice Marshal. The US had barred Pakistan from using the F-16s against any third country and it was only allowed to operate the fighter in self defence and for anti-terror missions, according to officials. They said Pakistan does not have any other aircraft to deploy AMRAAM missiles. "We can conclusively say that Pakistan used F-16s in the strike on Wednesday," Kapoor said. He said Pakistani aircraft package which was part of the Wednesday's operation comprised F-16s and JF 17s and perhaps some Mirages and that India countered them with Mig 21 Bisons, Mirage 2000s and Sukhoi 30s. Sources said Pakistan deployed around 24 aircraft out of which three came inside Indian airspace. On Wednesday's operation by Pakistani Air Force, Kapoor said the Pakistani jets attempted to target military installations but IAF aircraft thwarted their plans. "The PAF bombs have fallen in Indian Army formation compounds, they were unable to cause any damage to our military installations," he said. He said there have been many factually incorrect statements made by Pakistan after the retaliatory strike Wednesday including its initial claim that two IAF aircraft were shot down by Pakistan and three pilots were downed. "This figure was later revised to two IAF aircraft and two pilots. The fact however, is that Indian Army units had reported sighting two parachutes falling in the PoK which were of two F-16 pilots shot down by the IAF MiG-21 Bison. "Pakistan later in the evening changed its statement to say that one Indian pilot was in their custody," he said. He also rejected Pakistan's claims that they intentionally dropped weapons in open space where there was no human presence or military posts.